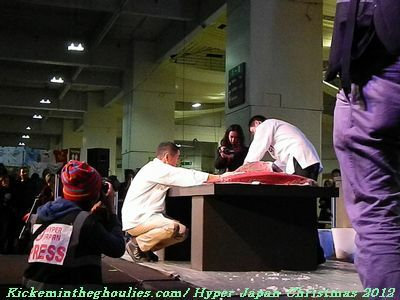 It's been a few weeks since Hyper Japan Christmas ,so it's a good time to give my opinion of the show ( the hype around the show has died down ) ,so what has left a lasting impression on our minds ? 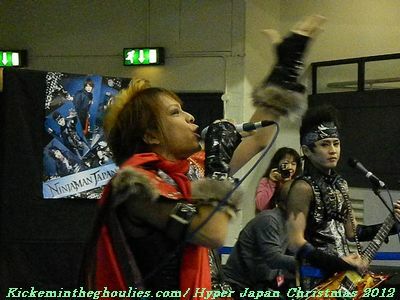 Now this was the fourth Hyper Japan and the second held in Brompton Hall at Earls Court in London. Of course the hype surrounding the show before it's show date was mounting as act after act was announced and the exhibitors list growing. Now we where impressed with the May show and wondered how they could improve or even match the event. Now Hyper Japan plays host to all things connected to Japanese POP culture from Jpop,Video games,Anime,Martial arts and more. Opening on Friday the 23rd of November at 2.00pm and ending on Sunday at 5pm the show attracted many visitors , Now I remember the Friday in May was a bit sparse for attendees ,but this time the turn out seemed better for the Friday ,i think this was due to the fact that that they had a special appearance by Tomoyasu Hotei happening that day. Now I had arrived not long after opening and picked up my press pass and entered the hall. ,Of course being early the show floor was easily navigated. Probably the first thing to surprise me was the teeny tiny stand Nintendo had compared to the May show and even the previous one. Now it was probably the most important time for Nintendo as the UK and European launch of it's new Wii U console was only days away . Now I had previously had a hands on experience of the console at Eurogamer Expo and MCM Expo in September and October where the Nintendo stands where huge. I thought Nintendo would be hard trying to push the Wii U ,but then after the problems of the USA launch on the 18th maybe they where keeping a low profile ,it all seemed weird to me. 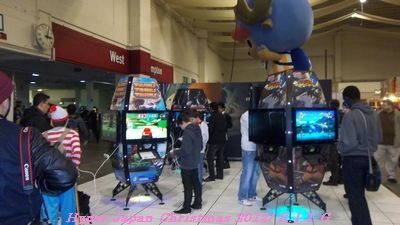 Now Bandai Namco had a fair size stand as always and showed a good range of games across PS3 and Wii U . Anyway after my Video game perusal I ventured off to see what else was on offer. Now One big thing at Hyper Japan is food and drink , With the Sake tasting and Sushi championships. I was offered a ticket for the Sake tasting ,but there was no way I was going to do that ,just don't do alcohol during the day. Though I am partial to Sake , I purchased a couple of bottles at the last show ,but must admit I forgot this time even though I visited a stand selling Sake, I meant to go back before leaving ( just hate carrying bags about) anyway I had my cameras and a tripod to handle . Now one thing you can do at Hyper Japan is spend money ,with sellers of Anime,Film,Plushies Food and many trinkets of Japanese origin . Now I am one to part with a few pounds when things catch my eye . There where a few Anime sellers and I must admit a took a wide berth as I had recently indulged at other shows and had a pile to watch . But my friend Joey Leung from Terracotta Distribution had a stand there and I did buy a couple of films. Now the main reason for being here was to see who was appearing on stage. 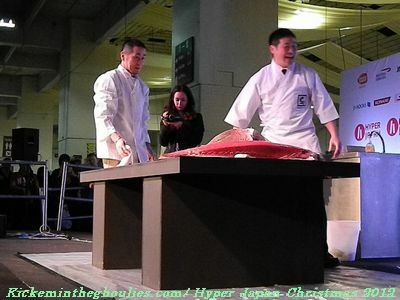 Now not being into Anime talks the first feature on stage I viewed was the Giant Tuna Carving ,well I never new tuna where so large ,and the hosts said that this was small . It was quite a thing to see as the Expert cut into this big piece of fish. 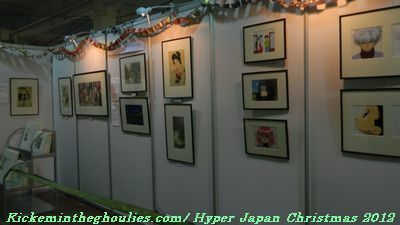 Also at Hyper Japan was a smaller activity area where artists would perform smaller shows and other workshops would happen. Friday was the day that Tomoyasu Hotei the Japanese rock guitarist would perform on stage , Now for people not in the know Tomoyasu Hotei wrote the tune ''Battle Without Honour and Humanity '' the track was used in Kill Bill by Quentin Tarantino and since then has been used by others in films ,commercials and more. 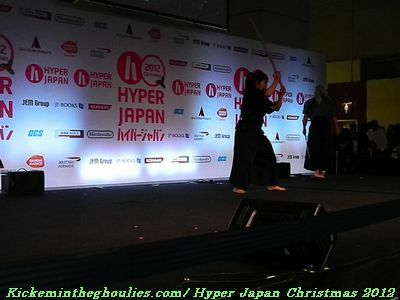 Also appearing over the three days of Hyper Japan was Japanese Swordmaster troupe KAMUI. 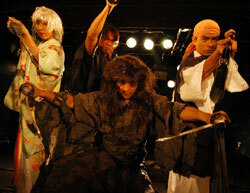 , they also had links to Kill Bill in that they Choreographed the sword fights in the film and Tetsuro Shimaguchi (the leader of Kamui) also appeared in Kill Bill as one O'ren ishi's bodyguards ,a member of the Crazy 88's ,even though his part was small ,but he's the first to attack Black Mamba(Uma Thurman )when she comes face to face with O'ren ( Lucy Liu) at the house of Blue Leaves , his name in the film is Mikki . The workshops looked informative and participants got to train with members of the Kamui group so it was quite special . 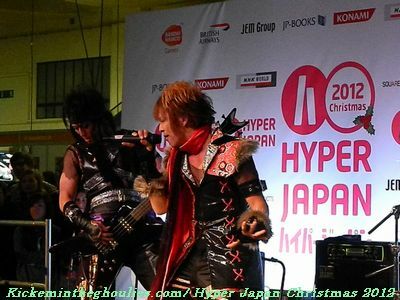 Now I was waiting for Kamui to appear on stage and in the meantime got to see Visual Kei Group Ninjaman Japan perform a mini set on the activity area. Well not being that into Japan rock (I'm more a JPOP fan) though I do have a passion for T.M Revolution. Well I was in for a surprise! Coming onto the Activity area announced by two support members coming on and trying to excite the crowd . When they finally do come on they end up fighting each other in what looks like some old school fight film with sound effects which they time there hits to (hard to do) then once they have dispatched their foes they grab their instruments and bring on the rock. Even if your not into this type of music ,you will be entertained by the raw energy of these guys in their Ninja inspired Glam rock style. Having seen them I was looking forward to their appearance on the main stage on Saturday. After another peruse and it was nearly time to see Kamui on stage , I got some munch and found a spot to get some shots of them and settled in. 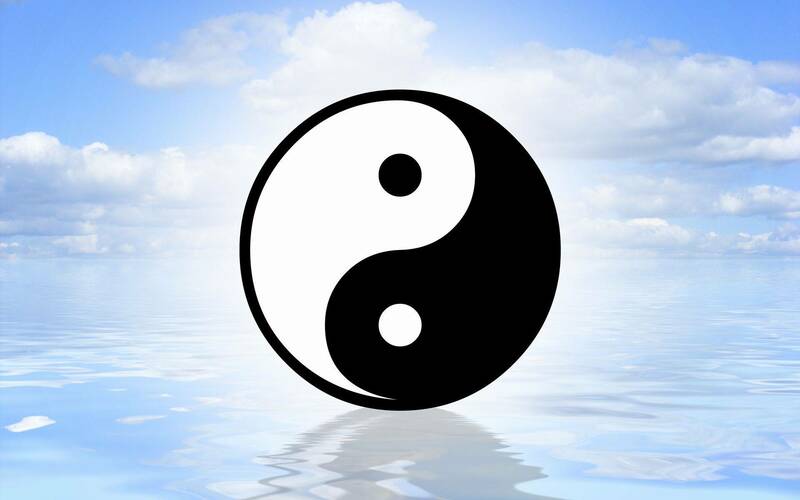 Now not to sound like boasting but I have seen quite a few good and some awesome Martial art performers in my time, and being a martial artist I have a understanding of it to . Maybe that's better as I really know how hard things are to do. Well time had come and Kamui where announced on stage ,coming on stage they performed a series of choreographed fights like you would see mainly in some far eastern action film, and all to tracks from the Kill Bill soundtrack (which they are most known for in the West) , the crowds where lapping it up with rounds of applause happening during the sequences as everyone got into the action . Some of the action is quite emotional while other sections are comedy orientated where slight audience participation is encouraged with hilarious results. But hey the night was not over the appearance of Tomoyasu Hotei was to come with him coming on stage to rapturous applause and performing the well known Battle without Honour and Humanity in a way many would have ever heard . It gets even better when Kamui appear to perform behind him as he plays . Some times events happen that are unique and to have been present at such a event was amazing and something no one there will forget. Hey this was only Friday and the night was still going. 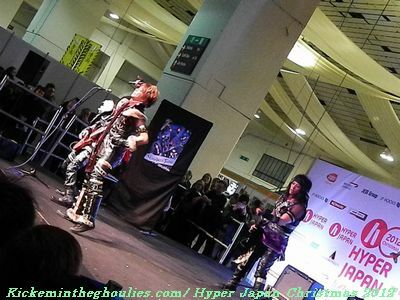 Now also appearing that night was the Micro Head 4N's another Visual Kei band ,they where due on the main stage at around 7pm ,again the crowds flocked to see them, but I think it was all a bit of a let down as many thought they would perform but as only three members of the five member group where present. What we had was Q+A with the group with video footage in the background. I did notice quite a few people leave once they realised there was no live performance. 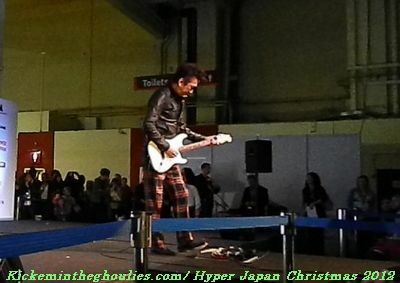 But in the end the first day of Hyper Japan Christmas was a resounding success as many left Earls court in awe of seeing Kamui , Tomoyasu Hotei ,Ninjaman Japan and others that day. Looks like I was up for a early night as Saturday was going to be a long one. Now Saturday was the day of the cosplay competitions and parade as well as Kamui doing a morning show on stage as well as there workshops. Now not getting there to early , I arrived after Kamui's show and the place was getting busy , Cosplayers where out in force and I was getting some shots of the various costumes people where wearing. All are a great bunch when you ask for a shot of them . Now as the Cosplay parade approached the area around the stage was quite busy ,we had the Parade and the WCS and ECG competitions to get under way. The whole process is well over a hour or so and each of the Cosplayers got gratitude from the crowd . Of course cosplayers that played to the crowd where engulfed with applause . So if your going to strut your stuff then give it some welly to get the crowd going ,those that seemed a bit nervous didn't fair to well at times with the presenters geeing up the audience at times. Now the WCS ( World Cosplay Summit) is a international cosplay gathering which takes place in Nagoya Japan ,here we had the competition for the UK entrants to see who would represent UK in Japan. With some stiff competition the winners who nailed the prize after wowing the crowds where Erin Bower and Heather Lawrence who cosplayed Eiko Carol and Vivi Omithier from Final Fantasy IX .Congratulations to them . Now the ECG (European Cosplay Gathering) is a contest that takes place in Paris ,it's been running three years so is still quite young compared to the WCS. With the ECG there are two sets of entrants ,Group and Solo. Saturday at Hyper Japan saw the group contest under way and again the it was hard for the judges to decide amongst the entries. Congratulations must go to the Group winners Lettie Shield and Claudia Maw as Frodo Baggins and The Witch King from Lord of thee Rings. By now it was time for food , taking pictures for over hour and half was energetic work. Anyway next up I was looking forward to seeing Ninjaman Japan on stage ,so re-hydrated and snacked out I got some more shots of cosplay participants and wandered around , I caught some more of another Kamui workshop and got some great shots there to. 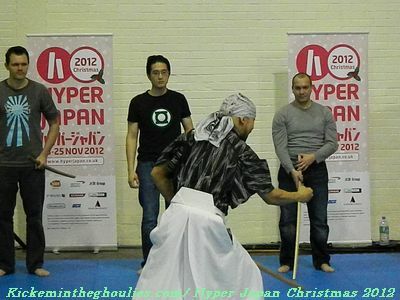 Look out for our Hyper Japan Kamui special in a few days. So Ninjaman Japan on the main stage on Saturday , well I new what to expect now ,but now of course it was going to be longer and louder . The crowds where rammed in with hundreds of people standing around the seated area. Of curse having a press pass I was by the stage ,great for some nifty shots. When Ninjaman came on stage it was like someone had sent a electrical charge through Earls Court ,everyone was so into it. Their antics on stage left the audience on the edge of their seats then when they started playing well you could have sold another 10'000 tickets to this no problem. 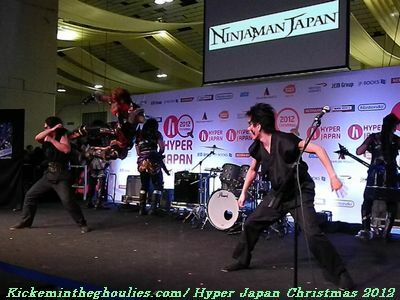 For about a hour Ninjaman Japan entertained the audience with out for one moment looking tired or out of sync or tune. For a live act to perform their stage act which is so cardiovascular . By the end of it I was bushed and everyone had a excellent time . The next day I was joined by a fellow site contributor Snow Leopard we got there early to see Kamui perform their act in the morning. It was rammed around the stage area by 10pm . Kamui came on to perform a slightly different set to the Friday one which was refreshing and once again left the crowds clapping repeatability. We got some good photos of the group doing their show ,with each applause they played to the crowd and the cameras. Unfortunately my cohort had to leave early to get to another venue he was covering ,which was a shame as I had booked myself on the final workshop with Kamui ,as you know all to well to write about something you must experience it to . Venturing around the stalls we sampled some Sake and had some Green Tea and Japanese sweets. You know I don't mind most Japanese style food dishes like Noodles,Squid ,Chicken and so forth,but I must admit Japanese sweets must be a acquired taste. We also got to experience the Wii U console on the Bandai Namco stand to. Look out for feature on that to shortly . Now the ECG solo competition and cosparade was due to start shortly and my cohort had to leave. 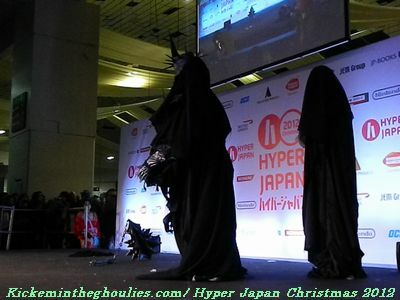 I made my way to the stage area and waited to see the next leg in the cosplay competition. Like the previous day there was a cosparade before hand where cosplayers showcased their costumes on stage , and like the previous day there where many great entries. By the time it was time for the ECG solo competition everyone was well into it. Like the previous day the the judges had a difficult decision to choose between the entrants. In the end the winner was Kyle Whittington who cosplayed Kuma from Afro Samurai. ,so he will be going to the ECG finals in France next year. Next up on stage was Wa-pop by Tomoca but as I was due to be on the last workshop with Kamui I failed to see this one as I wanted to get some beverage and loosen up a bit before hand. Though I had seen Tomoca on the activity area before. So the time had come for me to partake in the Kamui Workshop , there was a good turn out in the participant stakes which I was kind of glad of as there where quite a few people watching . 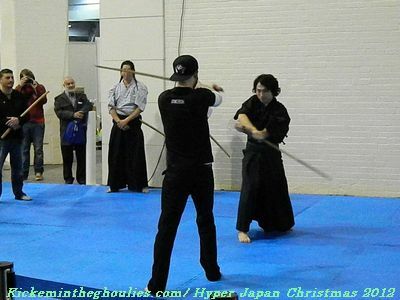 Tuition from the Kamui team was very good and precise which made for a great experience ,for more on the Kamui workshops and stage shows be sure to check out our Kamui at Hyper Japan special. By the time the workshop was over it was time to get ready to leave with only fifteen minutes before the closure of the show. 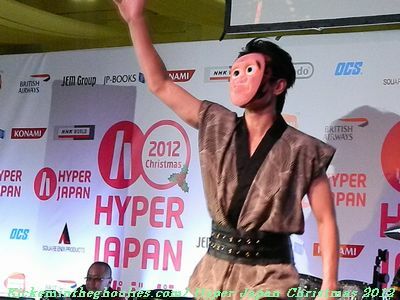 So how did Hyper Japan compare to their show back in May 2012 ,well it was a improved show by far on what was already a good show. What made the Christmas event better was the amount of acts appearing and the fact that if you filed to see anyone one day chances are you could catch them on another day of the show. The Kamui workshops where a great addition to the show as where the autograph sessions for the fans at a designated area for fans of whichever act they cared to indulge in. 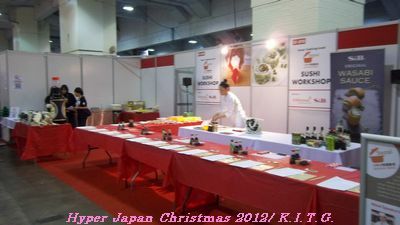 The food display area was vast with Kikomin and other culinary artists putting on a good show ,though I must admit I failed to see a lot of these. 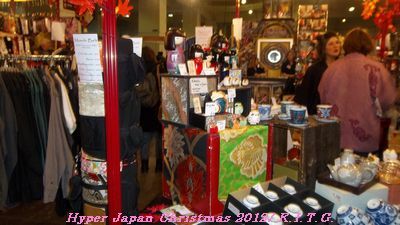 I also found the selling area a better experience with more varied sellers to entice visitors to part with their cash. But like I said I made sure I didn't spend as I never would have got it home. It was lucky really as taking the train meant I new I could not buy , If I had drove I would have been making trips to and from the car with goods. From a cosplay point of view Saturday seemed to be the main day with the largest amount of visitors in Cosplay compared to the other days. So can it be improved ,of course it can .There's always room for improvement in any event. I was glad to see a retro video game section to as many cosplayers cosplay characters from quite old games sometimes. Maybe next time this can be bigger , I would also like to see the photo walls from May for photos to be done in front of return ,though their where to walls set up they where designated for for Autograph sessions and only empty between sessions. 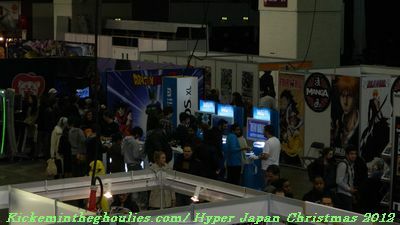 Now this year Hyper Japan estimated roughly 46'000 people visited the event over the three days a big chunk more then in May . I do feel that for their next show they need more space ,but we all know more space means more money and the only way they can do that is if more people agree to display or perform at the show. In the games department I would like to see companies like Sega,Capcom and Tecmo Koei appear in force . Also more activity areas, maybe one dedicated to martial arts ,in London there's not a shortage of Martial art clubs who do show displays. 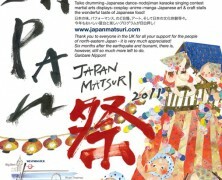 How about a Karaoke stage where visitors could try and perform their favourite JPOP or JROCK tune. There wouldn't be a shortage of participants not with the amount of Sake and Japanese beer on offer. Anyway I am sure they have it in hand ,but maybe fans should go to pages on facebook of the likes of Capcom and Sega and any other Japanese artist and put in'' Will you be at Hyper Japan next year '' with enough hits you never know we may persuade a few who never new. For us Hyper Japan was a fun filled three days which left us exhausted and yes where still sifting through the pictures . 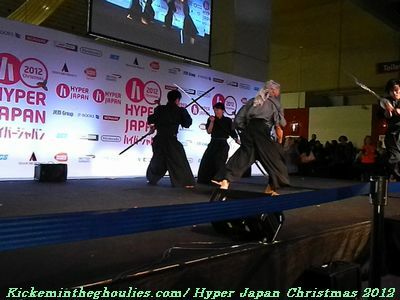 Don't forget to check out our Kamui at Hyper Japan page ,especially if you where there and partook in one of the workshops. 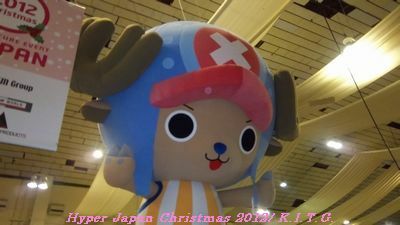 But from us Hyper Japan Christmas gets a big Thumbs Up!